The Egyptian Mouthbrooder, which originates from the Nile River, will grow to 2.5 inches in length and is well suited for most community tanks. This small cichlid is very peaceful as long as its companions are too large for it to swallow. Living Environment : All flake and freeze-dried foods are eaten. The Firemouth Cichlid grows to 5 inches. This relatively peaceful species should not be kept with very small fish but otherwise is suitable for most community tanks. It can be somewhat territorial but poses no real threat to any good-sized tank mates. 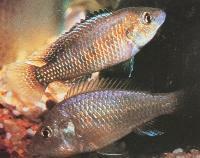 The fish has a brilliant red underside, a smoky gray upper body, and dark splotches scattered along its flanks. Living Environment : The Firemouth Cichlid can be fed all flake and freeze-dried foods, and will take pellets when it grows larger. A schooling fish, the Glowlight Tetra grows to about 2 inches and can be kept with other fish of similar size and temperament. The Glowlight Tetra's common name comes from the obvious iridescent red stripe down the fish's side. The stripe also has a faint golden shadow along the top, which stands out in good light Males are a bit slimmer than females, but the difference is slight and doesn't really serve as a useful way to distinguish between them. 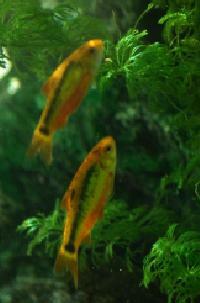 The Golden Barb grows to 2.5 inches and should be kept in a shoal. This particular barb is unique in that its origin is unknown. It may actually be a color variation of the Chinese Barb and not a separate species at all, which is why the species name appears in quotation marks. Living Environment : This fish needs a large open area for swimming surrounded by plants. Males of the bred species can reach 1.5 inches, and females typically grow to about 2.5 inches. One of the most popular aquarium fish, the guppy is a live-bearer, meaning it does not lay eggs but produces live offspring. Although the wild form is occasionally seen in stores, most are selectively bred forms chosen for their color pattern or finnage. Living Environment : Unlike the hardy wild specimens, aquarium strains are sensitive to water quality. All flake and freeze-dried foods are eaten by guppies, but live brine shrimp should also be offered regularly. 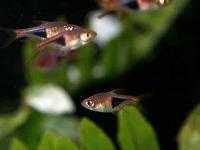 The quiet Harlequin Rasbora grows to 1.5 inches and is best kept in small groups. The Harlequin Rasbora is a muddled orange and pink with a prominent blue-black wedge that starts midbody and tapers back to the tail. The coloring is usually more pronounced in the males. A small, timid fish, it should not be kept with more active or aggressive species. Living Environment : Flake and freeze-dried foods will provide a sufficient diet. Dark aqua capping and subdued light suit it best. The Head and Tail Light Tetra grows to about 2 inches in length and does best in shoals. Colors are more intense with dark gravel and background. Females are just a bit larger than males and have a fuller, deeper underbelly. These fish are also sometimes referred to as Beaconfish. Living Environment : The Head and Tail Light Tetra does fine on flake and freeze-dried foods, but it benefits from the occasional feeding of live brine shrimp, as do all tetras. The Keyhole Cichlid grows to four inches and should be kept only with other peaceful fish. These very gentle, almost timid, cichlids have an irregular blotch on the side that resembles a keyhole, and they sometimes change color when startled. Living Environment : The Keyhole Cichlid will eat all flake and freeze-dried foods and should have an occasional feeding of live brine shrimp. The tank should contain plants and driftwood to provide security and hiding places for the fish. Although the Kissing Gourami can grow to 12 inches, in most tanks it only reaches about half that at the most. The "kissing" done by these fish is not a sign of affection; the behaviour is used to settle minor disputes. Living Environment : All flake and freeze-dried foods are eaten, but a substantial amount of the Kissing Gourami's diet should include vegetable flakes or, especially for larger fish, vegetable pellets and blanched zucchini.